The HJC-461 Pro is the ultimate power communication system. Using FM transmission you can ride and talk up to 2 miles apart. Great for fun or emergency use. 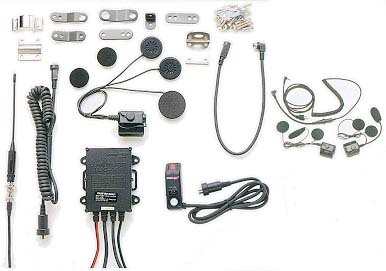 The 461 Pro comes with everything you need (shown below): The rugged, water-resistant 461 FM with CTCSS circuits receiver and transmitter unit; handlebar mounted remote control, power cord; driver in-helmet speaker and mic set; mini antenna and cable; and all necessary mounting hardware and wiring. The result is our most powerful system right at your fingertips. HJC-461: Here's What You Get!